Keeping your immune system running optimally is one of the best ways to prevent getting sick at all. Plenty of Vitamin C, Vitamin D and Zinc are the first line of defense for your body, Using thieves oil on your hands and feet also helps. Saccharomyces boulardii helps bind toxins and restore normal gut functioning. Our nutritionist, Bob, told me several years ago that this can help prevent the stomach flu and I have used it ever since, cranking it up a few notches when the stomach flu is going around. I have had much less severity of the bug than the rest of my family, so maybe it does work! We offer it here as Sacro B by OrthoMolecular or in Orthobiotic probiotic. Probiotics: Keeping your gut balanced and healthy will help it be less vulnerable when the germs strike. Read more here. If you have the stomach flu, one of the best gut-rebuilders on the market is GI Replenish by Metagenics. It has an amazing combination of ingredients that help calm and heal the gut. (It is also great after you finish a round of antibiotics, which is what I am currently using it for.) We have it here in chocolate and vanilla. Dr. Sprecher likes Perma Clear from Thorne, which has glutamine, saccharomyces boulardii and bacillus coagulans, and ginger, all great stomach soothers and rebuilders. Another option for electrolyte rehydration when you've been sick is Endura from Metagenics, which is a little pouch that is poured into a water bottle. It contains electrolytes and other vitamins, is convenient and tastes great. Standby Gatorade is also a good (maybe a bit sugary) option. • Digestive Upset: Symptoms include nausea, stomach pain, heartburn, gas, diarrhea, cramps, or bloating which begin immediately or up to several hours following a meal. • Headaches or Migraines: Most people who suffer from migraines can point to a specific food, or several foods, that seem to kick off their headaches. Common triggers include wheat, dairy, yeast, corn, and eggs. Tyramines are another common irritant, and they can be found in foods including cheese, wine, avocados, bananas and citrus foods. • Depression or Anxiety: More than 90 percent of serotonin is produced in the gut, which is often referred to as our “second brain.” It therefore makes sense that what happens in the gut affects our moods. • Skin Disorders: These include eczema, rosacea, acne and psoriasis. Research has indicated that the gut and skin are tightly related, and removing trigger foods can make a big difference in keeping sufferers more comfortable. • Fatigue: Food sensitivities cause inflammation, which taxes the body. If this occurs on a chronic basis, it can lead to constantly feeling tired. • Joint Pain: It may seem hard to believe, but research has shown a connection between joints and the gut. Many patients with joint pain noticed significant improvement when problem foods were removed from their diets. • Insomnia: The body’s inflammatory response to problem foods can make it difficult to fall asleep and stay asleep. An unfortunate side effect is that lack of sleep can make the body crave things like bread, sugar and alcohol, which exacerbate the problem. • Weight Gain: Food sensitivities can interfere with the signals the gut sends to the brain after eating, leading the brain to indicate a higher “set point” for weight than a healthy person would have. • Allergies: Runny nose, blocked ears, coughing and sinus pain may be linked with food sensitivities. Research has indicated that patients show considerable improvement after removing trigger foods from their diets. 1. The most cost-effective way to determine your food sensitivities is an Elimination Diet. Most common triggers are eliminated and re-introduced over a period of weeks. This requires vigilance, discipline and an ability to keep a food journal. 2. We offer food sensitivity testing, also known as the Alletess, which is done by blood draw. On the plus side, you will get a very specific list of 184 foods and your level of sensitivity. However, it is not covered by insurance and costs $350. The results take about three weeks to come in. When sorting through food reactions gets overwhelming, the Alletess can help provide very specific answers. 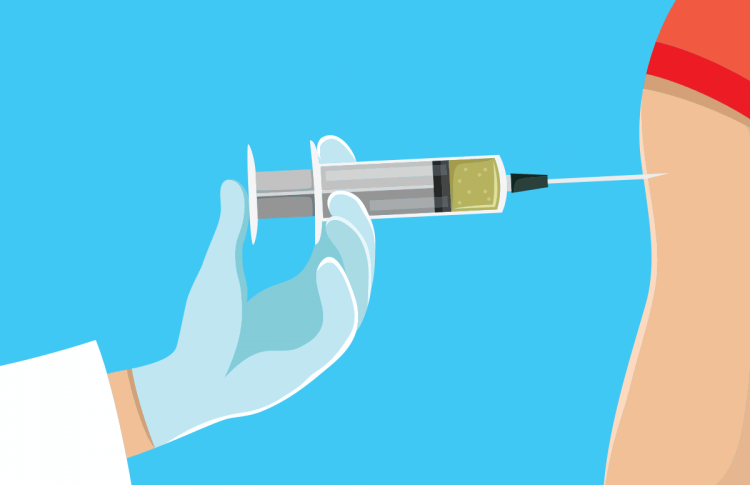 To get the flu shot or not get the flu shot? It seems like everywhere you go, advertisements are luring you to "get your flu shot here!" Some people say they never get sick as long as they get the flu shot, while others shy away from it due to side effects. What does Dr. Sprecher recommend? She advises you do what feel right for you. If you fear the flu, get the shot. If you fear the shot, don't get it. The best defense against the flu is simple hygiene and keeping your immune system strong. We suggest lots of handwashing, and thieves' oil, which can be used as a room spray, disinfectant, and hand sanitizer. It can even be applied to the bottoms of your feet. Dr. Sprecher also advises taking Immucore, one daily and Vitamin C to protect yourself from illness. Our Ultra Potent C is fat soluble and stays in the cells longer to pull the bugs out. When you are sick, Candi-Bactin-AR serves as a natural antibiotic, and Sinatrol helps keep mucous moving through the sinuses. Let's hope for a mild flu season, but it never hurts to be prepared! ​The subject of toxins can be overwhelming, because it is something that feels hard to control. You can be vigilant about avoiding gluten, exercising every day,and limiting sugar. But how do you manage something that is literally everywhere...your food, your home, your workplace, even your backyard? Toxins are foreign invaders into your body, and too much accumulation can affect your health. Several factors contribute to your body's toxic load. Do you eat lots of food sprayed with pesticides? Does your DNA handicap your body from processing toxins? (This can be revealed in 23 and Me or Ancestry gene testing.) Are there strong chemicals being used in your workplace? Do you have mercury fillings or other exposure to heavy metals? Do you have water damage in your home or workplace? These are all contributing factors. Certain viruses or autoimmune conditions can also make you more sensitive to toxins, as can GI issues such as a leaky gut which allows toxins to seep directly into the bloodstream. Evidence of toxic overload includes fatigue, body aches, sinus congestion, GI issues, skin irritations and anxiety/insomnia. Also, weight gain/difficulty losing weight is associated with toxins, as the body attempts to make them less concentrated by dispersing them into fat. Try to minimize exposure to toxins you can control. Eat organic foods, the less processed the better. Pay attention to products you use on your skin, such as soap and makeup. Try to use non-chemical cleaners in your home, and limit exposure to artificially-scented candles and air fresheners. To find ratings on the safety of products, click here. Eat foods that are natural detoxifiers, such as cabbage, broccoli, brussels sprouts, and garlic. Chlorophyll water and green tea also help with detox. Supplements such as Vitamin C, Glutathione and Activated Charcoal (GI Detox) are used for detox. Charcoal is becoming a popular ingredient in many products (i.e. facial cleansers) because of its ability to bind toxins. 1. Nuts. If you are allowed nuts, they are a great high-protein, high-fat snack to take on the go. 2. Protein bars: You will want to get high-quality bars, the less ingredients, the better. 3. Simple Mills crackers: Dr. Sprecher loves Simple Mills, and with good reason. These crackers are very tasty, but low in carbs. Top ingredients in these crackers are nuts and seeds. 4. Nut or seed butter packs: Nearly every kind of butter, such as sunflower seed, peanut or almond, comes in packets these days. Pack a few with you, and you will always have a filling, high-protein food option. 5. Meat sticks: Get grass-fed meat, the less processed, the better. 6. Dark chocolate: Dark chocolate is lower in sugar than most candies, and offers antioxidants. Fruit and vegetables: This depends on your travel situation, but if you can, pack apples, bananas, carrots, celery, snap peas, or berries. These are sometimes available in airports or at rest stops. The bottom line is that the more you prepare, the easier it will be to eat healthy on your trip. While it is tempting to throw caution out the window ("Hey, we only do this once a year!") the ramifications may not be worth it. On a side note....do not let your food-packing get too overwhelming. Last summer, I was so focused on packing food for my daughter and me that I forgot my wallet. I went to check in at the hotel and the driver's license, credit cards...all at home. And I forgot my pajamas and glasses. But we did have every meal and snack covered! If you need further assistance with eating on the road, contact me at kate@neoifm.com. Sunscreen- some say you need it all the time, others say it is harmful. Bug spray. You need it protect yourself from bites and possibly diseases that come with them, but it has been revealed to contain toxic chemicals The conflicting information surrounding summer necessities can be overwhelming. The Environmental Working Group (EWG) breaks down thousands of products, rating them based on whether they have dangerous chemicals, and, if so, how much. Sunscreens: The group found that two-thirds of sunscreens contain oxybenzone, a known allergen and hormone disruptor that has had damaging effects on the ocean ecosystem. Many also contain retinyl palmitate, a form of vitamin A that is known to harm the skin. The FDA has found that higher SPFs often do not provide extra protection, and may lead people to spend more time in the sun. The best plan, they say, is to avoid the sun during peak hours, cover yourself with clothes and wear sunglasses. If you do need a sunscreen, some brands that scored well include Neutrogena, Tom's of Maine and Banana Boat. To find the best sunscreen for you, find the complete report here. Bug Sprays: Most of us cringe when we apply bug spray just based on the strong chemical scent alone. DEET, which was often promoted as the most effective ingredient in repelling bugs, has received negative press due to the fact that it is considered a neurotoxin. The EWG has found that it is relatively safe in small amounts, and should be an option where disease-carrying insects are prevalent. Other options include Picaradin and IR3535, which have fewer risks but are nearly as effective as DEET. For those who favor botanicals, oil of lemon eucalyptus, peppermint and rosemary are options. For more on bug repellents, find the link here. With the seemingly endless winter weather, the warmth of spring has been eagerly awaited here in northeast Ohio. However, the arrival of pleasant weather also means the beginning of allergy season for many. The season has come on very strong this year, as the delayed spring means everything has blossomed at once. Nasal irrigation: This comes in the form of Netti-Pots, Nasopure, and other small bottles with saline solutions. Using these helps rinse out nasal passages, and restores moisture and reduce inflammation of mucous membranes. Take one tablespoon of local honey per day. This helps your body build resistance to pollens that are polluting local air. Quercetin is a bioflavonoid that stabilizes the release of histamines in your body. They can be naturally found in cruciferous vegetables, onions, green tea and citrus fruits. It is also available in supplement form. Essential oils such as eucalyptus and frankincense can help reduce inflammation and improve detoxification. They can be used with diffusers, or mixed with coconut oil and rubbed on the body. Stinging nettle is an herb that can be found locally, but its needle-like edges make using it nearly impossible. Try it in capsule form to benefit from its natural histamine-blocking abilities.